To make this tastiness I must start with the how the heck you spiralize a butternut squash – shiz ain’t easy. Don’t worry Inspiralized has some step by step instructions – oh and you really need to put some muscle in it. Now here is the recipe. What did I change you ask? 1. I didn’t measure any spices or oils – whoops! 4. I used two Chorizo sausages from whole foods. 5. I didn’t measure the butternut squash I just noodled a medium sized one! 6. I used a full avocado – hey I like my fat. 7. I don’t do cheese so no cotija for me! 8. I cut all my tomatoes in half – whoops! I need to learn to read instructions. This is soo good. I have enough butternut squash/chorizo mix for lunch tomorrow and I am super excited about it. The egg is such a great touch and I topped mine with some extra S&P and then some Siracha- SPICY. Get a spiralizer and have fun with veggies! 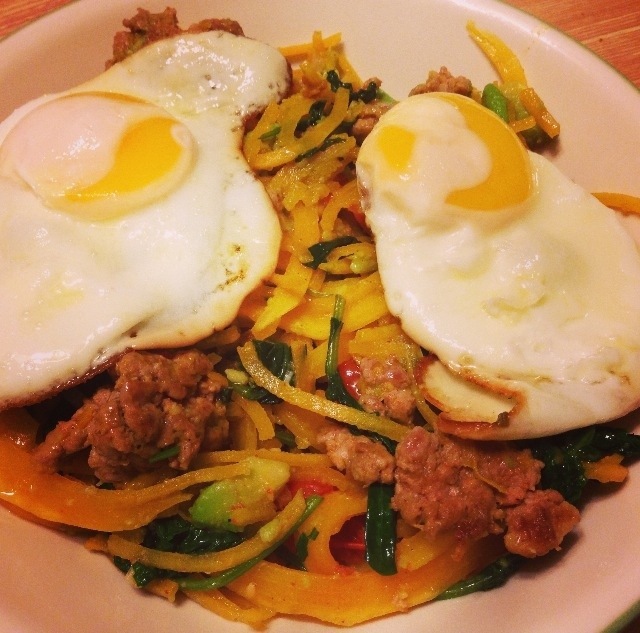 This entry was posted in Breakfast, Dinner and tagged butternut squash, chorizo, crossfit, eat clean, egg, inspiralized, kale, paleo, paleology, spiralizer. Bookmark the permalink.